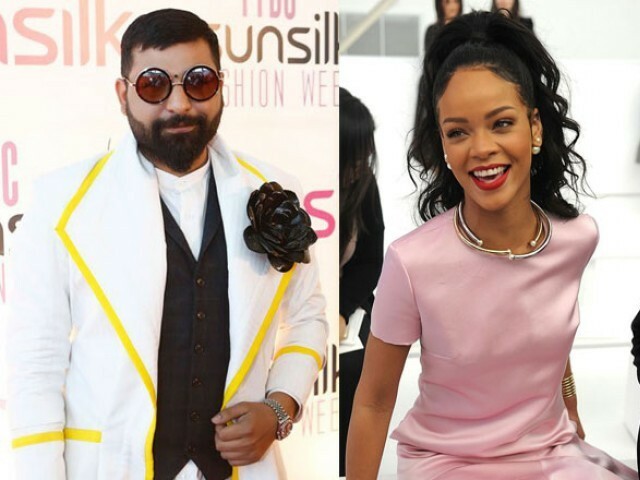 Pakistani fashion designer to design wardrobe for Rihanna! Undoubtedly when it comes to clothes, Pakistanis have a style and fervor of their own. And with the best fashion designers in the world taking an inspiration from us, we certainly are pretty talented in this domain. Thus when Pakistani fashion designer Ai Xeeshan was approached by none other than the great Rihanna to style her wardrobe not many were shocked (though some across the eastern border might have been shamed). Ali Xeeshan is one of the most talented fashion designers in the country who has received a great response both locally and internationally. Today he is all over the world doing fashion shows from the coveted Mercesed Benz Fashion Week Doha and the recent Fashion Parade in London. According to him he has done several fashion shows abroad but his experience in London was the best. For there Xeeshan walked the ramp at the Fashion Parade, with the beautiful British Pakistani Burberry model Laila Naim (kudos)! Undoubtedly designing wardrobe for the Grammy award-winning Rihanna will be the defining point of Xeeshan’s career and his unique design aesthetic being appreciated all over the world has certainly won him laurels from around the world! Bravo Xeeshan!